These seven astounding destination hotels have excelled themselves with imagination and ingenuity to deliver unique underwater experiences that will not be easily forgotten. From extravagant luxury to artistic eccentricity, there is an underwater hotel experience to suit any intrepid explorer’s tastes. 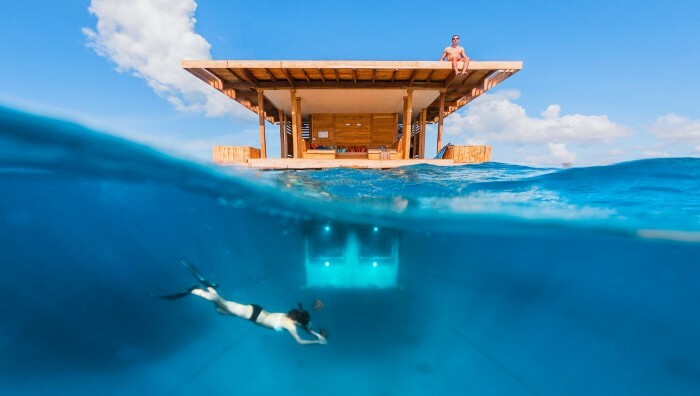 There are so many things that can go wrong with a vacation, but if you choose to stay at one of these incredible underwater hotels you can at least be sure that the accommodation will be perfect. Just off the east coast of Tanzania in Central Africa is where you will find this island paradise that prides itself on its untouched natural beauty. Pemba is a tropical and fertile land rich with crops of cloves, coconuts, bananas and rice, and its coast is equally rich in natural treasures. White sand beaches lead you into warm crystal blue waters that are home to natural coral reefs and steep drop-offs that are perfect for divers and snorkelers to see a diverse and colorful marine life. Here you will find the Manta Resort working in perfect harmony with the island and the local community to bring a slice of island life to its guests. They selected the location because it had the perfect conditions for them to create the astounding underwater room concept that they had designed. The resort has a selection of incredible rooms and suites to choose from, but their crowning glory is the pod floating approximately 250 meters off the shoreline. Upon arrival you will be rowed out to your own miniature personal island along with your own personal ‘fundi,’ who will be ensuring you have everything that you need during your stay. After showing you around the stylish and comfortable rooms, and discussing when and what you would like for your next meal, he will leave you to relax and enjoy your temporary new home. At sea level is the landing deck with a cool and contemporary open lounge and a fully equipped bathroom. From there you can climb a ladder to the sun deck, where you can catch rays during the day and gaze up at the unpolluted night sky and wonder at the number of stars you can see from this incredible location. 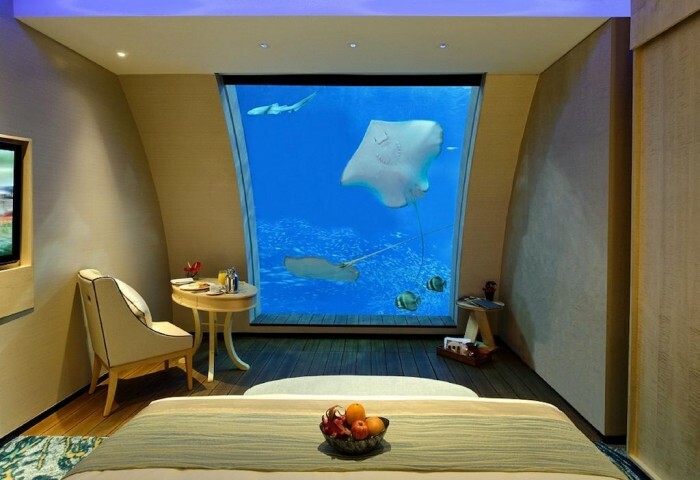 Finally you go downstairs from the lounge to find your astonishing underwater bedroom. 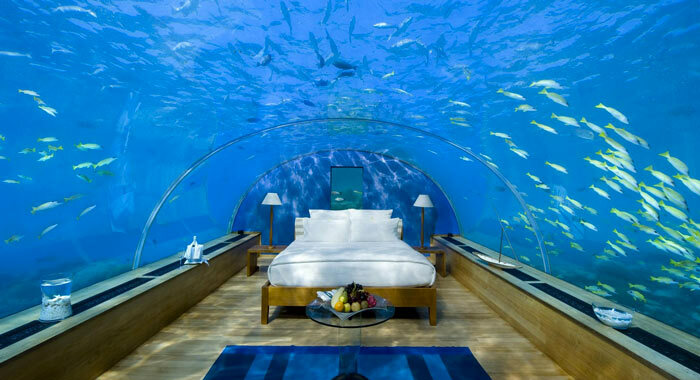 A massive bed surrounded on all sides by windows onto a marine paradise where you can lie back and watch shoals of tropical fish swim past, including some regular visitors who have started to call the place home. At night, blue spotlights illuminate the pod from underneath so that you can get a glimpse of the shyer nocturnal creatures too. You will have snorkels and flippers to play with during your stay and the resort offers diving lessons for guests too, so you can really get familiar with the incredible wildlife that lives just beneath the waves of this wonderful place. The Atlantis Resort sits on the apex of the world famous manmade archipelago The Palm in Dubai, which is a wonder in itself. The resort is an ostentatious and entirely artificial monument to decadence, opulence and luxury and no detail has been left to chance. Open since 2008, it has quickly gained a reputation for being the height of indulgence, and you can be sure that your every need will be catered to during your stay. There are shopping malls, nightclubs, over twenty restaurants, sports facilities and, of course, spas so there will be no need for you to leave the resort during your vacation. The entire resort is themed on the lost island of Atlantis and there is every type of water-related activity for guests to get involved in. There are lagoons, aquariums, water parks, rivers, beaches and pools. You will find every variety of marine life with coral, tropical fish, dolphins, sea lions and even sharks. All of the 1,500 rooms and suites are finished to the highest possible standard and will leave you wanting for nothing, but they have a few rooms that are particularly special. The underwater suites have all that you would expect from a five-star hotel with opulent furnishings throughout, sweeping staircases, a luscious lounge, private dining room and extravagantly designed bedrooms but with the addition of floor to ceiling windows in all the rooms that look onto the Ambassador Lagoon complete with the ancient ruins of Atlantis and over 65,000 marine creatures. This is an incredibly indulgent underwater hotel experience and one that will definitely suit those who want to enjoy the wildlife without sacrificing any home comforts. This is an entirely original way to have the ultimate underwater experience. The travel company Olivers Travels converted a leisure submarine into a luxury travelling hotel and they have given the customers that stay there the rather cheeky nickname of the Mile Low Club. This astonishing vessel has been designed with the honeymoon and romance market in mind and it really is the definitive extravagance. The submarine can be completely customized to each customer’s specification with everything from the interiors to the location being fully personalized. The submarine is sleek and stylish inside and out and all bookings come with speedboat transfers as standard. The possible locations it can be moored are endless and include living coral reefs and next to a shipwreck off the coast of the Dominican Republic. Each trip is shared with a staff of three — the captain, a chef and your own personal butler — and they are housed in a separate soundproofed part of the submarine to guarantee guests complete privacy. Well, private except for the thousands of marine animals that will be swimming past the windows in the exquisite lounge, bedroom and bathrooms. All meals are prepared on board by a world class chef and delivered to your quarters, and all stays include an aphrodisiac tasting menu. This is a once in a lifetime opportunity for any couple wanting to have the romantic getaway of a lifetime. This is an underwater hotel with a difference and it is definitely for the adventurous traveler rather than someone wanting luxury and indulgence. The English translation is the Otter Inn and it is as cute as its name suggests. The accommodation is moored on Lake Malaran in Vasteras, one of the oldest cities in central Sweden. The city has an industrial past but this is an interesting time to visit, as they are working hard to capitalize on the tourist industry and are undergoing some serious regeneration work. The climate is surprisingly warm in the summer months, which would be a perfect time to stay in the unusual Otter Hotel. It started life as an art project by local artist Mikael Genberg but has fast become one of Vasteras’ most popular tourist attractions. From the shore the dwelling looks like a very stereotypical Swedish house except that it appears to be floating on the lake. Guests reach their destination by taking a boat from the charming Vasteras harbour and would need to go prepared, as there are no meals or staff to look after you. The appeal with this hotel is its beautiful remote location, the rustic charm of its interior and the pure simplicity. There are two levels, and the top half floating above the water has a deck that surrounds the house and inside is a basic but fully equipped kitchen with gas-powered heating equipment and a separate dry toilet. To reach the bedroom guests make their way down a ladder through a wide pipe that leads to the bedroom hanging three meters below the surface. It is cosy and has windows on all four walls so that you can see into the clear waters of one of Sweden’s largest freshwater lakes. During your stay it is advised that visitors take the time to take a boat out to explore the islands that they will find on the lake. Both Bjorko and Adelso are UNESCO world heritage sites and are home to ancient Viking settlements. There are many reasons to make this very special place somewhere you can tell people you spent the night. Off the south coast of Singapore is the island of Sentosa, which has become home to another spectacular manmade attraction. There are over 120 acres of theme parks, hotels, exhibitions, water parks and the world’s largest oceanarium. Amongst the six hotels with over 1,500 rooms and suites there is a collection of twelve suites on one side of this mammoth aquarium. Each unit feels like a small townhouse and combines the benefits of being above and below water. The top open plan lavish living area opens onto an outdoor area with its own patio and hot tub. Head down the stairs and you will find a five-star bedroom with a huge viewing window onto the 40,000 marine creatures that live in the aquarium. All guests at these suites have full butler service, access to the resort’s water park, full gym membership and buggy transport to anywhere on the island. 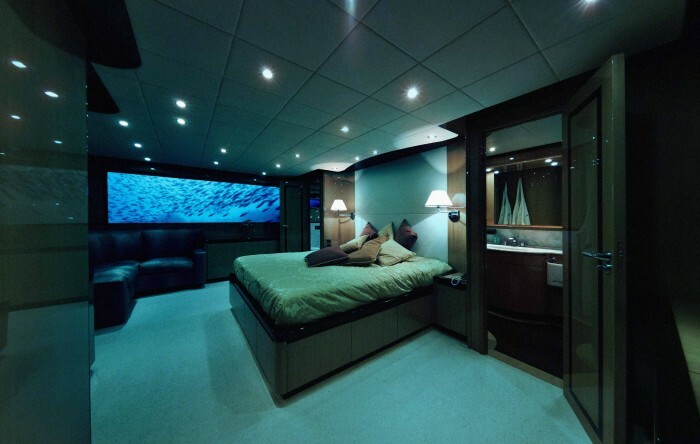 With Universal Studios on the doorstep and this suite to come home to, there is no doubt that this is an underwater experience with a great mix of fun and class. Despite not being open to the public yet, this resort is deserving of a place on this list, especially as you can now start reserving your place here since it is finally nearing completion. This ingenious mile-long structure is half submerged in 5,000 acres of tropic lagoon off the coast of Fiji. Just beyond the lagoon is a sheer drop-off that is a haven for wild and unusual marine life, all of which will be accessible using the resort’s own tourist submersibles. Guests will be able to explore above and below water in complete safety and comfort in the central structure, which will house restaurants, bars, a gym, a spa and there is even a library. The individual room pods coming off the central structure will also be available above and below the water depending on guests’ preferences. Each pod comes with high spec fixtures and fittings, including a Jacuzzi bath, and is covered by a glass dome offering a truly submersive experience. This is going to be an underwater experience that is tough to beat and those reservations will be filling up fast. The only undersea hotel in America is only for real underwater enthusiasts, as the only way for guests to get to their room is by scuba diving their way there and they will need to have passed their scuba qualification. 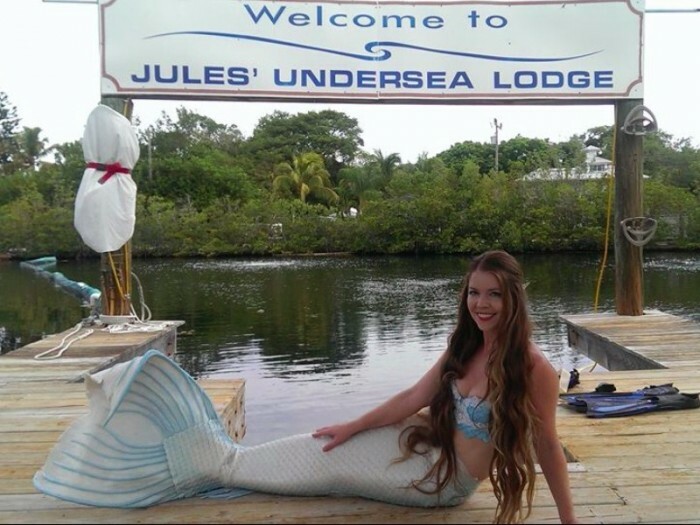 The lodge can be found in the Key Largo Undersea center, which started life as a scientific research center back in the 1970s but is now a very popular tourist attraction. Housed in the Emerald Lagoon, which is part of the Florida Keys, it was designed to investigate the underwater wonders of the shallow seas of Puerto Rico and is now located in a mangrove lagoon, which makes it a natural nursery for tropical fish. The lodge itself is actually used as a reef by many of the marine animals that live in the lagoon, so you really will feel like you are living in the ocean when you stay here. The lodge is 30 meters below the surface of the lagoon and suspended on legs, and upon arrival you swim under the lodge and come up through the ‘moon pool’ into the wet room. This is where you can take off your wetsuit before entering the accommodation. Straight in front of you is the unit’s toilet and shower facilities and to the right you’ll find two bedrooms, each with a porthole window onto the lagoon’s depths. Turn left and you’ll be heading into the common room with a full entertainment center, fully fitted kitchen which is well stocked with drinks and snacks, a communication center and sitting room. It looks like it used to be a research center, so there are no frills, but it has fun and adventure written all over it. The lodge has some quirky features to make your stay even more fun, such as getting a pizza delivery (I don’t know how) or you can have your very own merchef who will dive down and cook you an a la carte menu while you relax and watch the fish. This really is an incredible experience for anyone who loves diving and diving culture, and it could just be a great adventure for the novice too. I hope this list has inspired you to consider something a little different for your next big vacation! P.S. 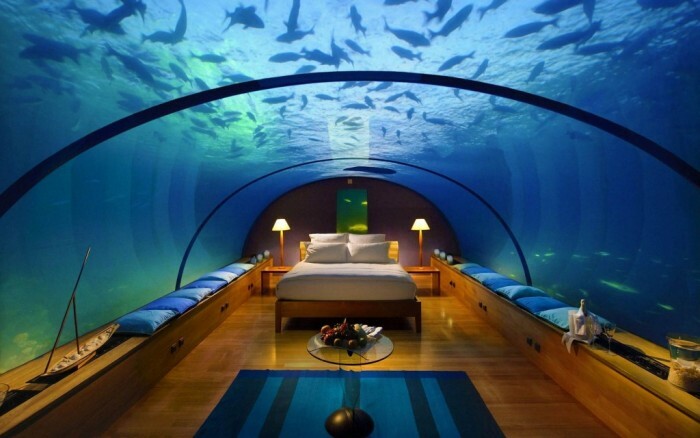 Are you brave enough to stay at an underwater hotel?